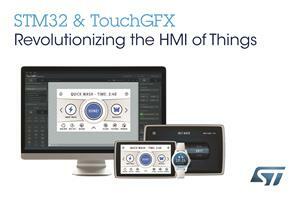 Geneva, November 28, 2018 - STMicroelectronics (NYSE: STM), a global semiconductor leader serving customers across the spectrum of electronics applications, is making its STM32* microcontrollers (MCUs) even more attractive to developers of IoT products and other smart devices by providing free software for creating rich, smooth, and colorful graphical interfaces that deliver a great user experience. The STM32 is the world's most popular Arm® Cortex® MCU family, with over 800 device variants and a powerful ecosystem comprising tools, middleware, software libraries, sample code, and evaluation boards that simplify product development and accelerate time to market. Following its acquisition of Draupner Graphics, creator of the acclaimed TouchGFX graphical user-interface development suite, ST is now making the software available free of charge for production and redistribution with STM32 MCUs. "Many customers have already successfully used TouchGFX to bring smartphone-like experiences to new products running on STM32 microcontrollers," said Daniel Colonna, Marketing Director, Microcontrollers Division, STMicroelectronics. "By incorporating the latest version in our STM32Cube ecosystem, with no license or royalty fees, and supported by our 10-year longevity commitment, we are making this powerful and innovative solution easily accessible on a global basis." TouchGFX is ready to use with STM32 microcontrollers and includes a C++ framework that enables the user-interface code to occupy as little as 10KB SRAM and 20KB Flash memory. It leverages the Chrom-ART Accelerator(TM) featured in STM32 MCUs with advanced graphics capabilities and contains a rendering algorithm that minimizes the number of pixels to be updated, enabling better graphics and smoother animations on a low memory and power budget. TouchGFX supports user interfaces with color depth of 1, 2, 4, 16, or 24 bits per pixel (bpp) and can run with or without a real-time operating system (RTOS).